A urinary tract infection (UTI) refers to a bacterial infection anywhere in the urinary tract, such as the bladder, kidneys, ureters, or the urethra. Most cases of bladder infection are acute (occur suddenly) versus chronic, and early treatment is key to preventing the spread of the infection. 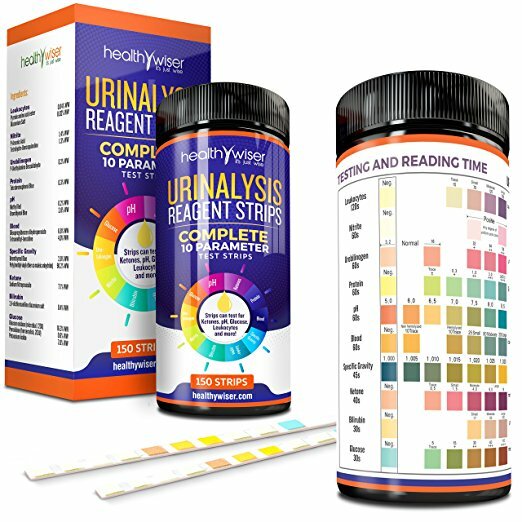 These are urinalysis test strips I use when I suspect a UTI. Olive leaf extract – I love love love this herb! It is an anti-viral, anti-bacterial and anti-fungal. I gave my 3 year old half a capsule of this brand which is 210 mg. The Bible refers to the olive tree as the “tree of life.” There is lots of research on olives, the fruit of the tree, and on the benefits of olive oil. Yet, the amazing healing powers of the leaves of the olive tree are not as widely known. The primary compound of the leaf is oleuropein which helps inhibit the growth of viruses, bacteria, fungi and parasites. It is an incredibly versatile herb and used for a myriad of health conditions from influenza, the common cold, candida infections, urinary tract infections, meningitis, Epstein-Barr virus (EBV), encephalitis, herpes, shingles, HIV, chronic fatigue, hepatitis B, pneumonia, tuberculosis, gonorrhea, malaria, dengue, severe diarrhea, and dental, ear, and surgical infections. Garlic – I have always had a love affair with garlic. I have used it myself for lots of things ranging from tooth pain, sore throat, to warding off a cold. Garlic is a powerful antibacterial, antiviral, and anti-fungal agent. Most of its health benefits are derived from a sulfur compound called Allicin. If you can stand it, chewing raw garlic cloves is a potent way to take garlic. When cooking with garlic, it is important to crush it in a garlic press or with a knife (vs chopping it) because crushing it is what releases the allicin. The garlic by Nature’s Sunshine is enteric coated, to make sure it gets to the small intestine without being compromised along the way, this way you glean the full benefit of the garlic. For the enteric coating, Nature’s Sunshine uses a natural chlorophyll film as opposed to shellac used by other enteric coated garlic brands. Because of the “locked-in” chlorophyll coating, this garlic does not cause belching or garlic breath. For children, I prefer this form of garlic, it does have an odor and may cause garlic breath but it is not as potent. KB-C – All the blends by Nature’s Sunshine I have used are magical. This blend supports and nourishes the kidneys. This helps the kidneys to remove toxins while protecting water-soluble minerals that support bone integrity. This formula may also help maintain the body’s proper acid/alkaline balance. Eucommia is the key herb in KB-C. It strengthens kidney energy. It has been used by those who are experiencing painful urination, impotence, backache, muscular weakness and osteoporosis. Achyranthes, another herb in KB-C, increases the production of urine and relieves pain. It has mucilaginous compounds that soothe inflamed tissue. Herbs that are mucilaginous moisten, soothe, and protect mucus membranes. KB-C has been used to combat painful urination, backache, and muscle aches. Another herb in the blend, ligustrum fruit, relieves pain, increases the flow of urine, strengthens immunity and tones the heart. It has been used for urinary tract infections, lower back pain, colds and flu. What I love about Nature’s Sunshine blends is that they mostly use herbs and not an isolated compound so it is delivering the healing as Mother Nature intended. There are always synergistic benefits to using the entire herb that are lost when we extract and isolate a compound. In addition, the blend of herbs are thoughtfully selected and also have synergistic effects when combined together, where they potentiate each other. By combining individual herbs you accrue an augmented healing benefit, so in essence, 1 +1 =3. Vitamin C – Liposmal Vitamin C by Lypo-spheric is so powerful. There is a problem with Vitamin C in that it is very hard for the body to absorb. By wrapping the Vitamin C in a fat (lipo), it radically increases the bioavailability (the ability of the body to absorb it). Some claim that liposomal Vitamin C is better absorbed than an IV of Vitamin C. I called the company to understand the dosing for little ones. They do not recommend it for children under two and then it should be given no more than one packet per year of life for kids. So a 4 year old can have a maximum of 4 packets. Each packet contains 1000mg of liposomal vitamin C. I am a believer in the Minimal Effective Dose (MED) – give the body what it needs and no more. Too much of a good thing can be bad, it can create imbalances. As the naturopath I studied with Dr Mary Reed Gates, likes to say – too much water and you drown! The good thing about Vitamin C is that even in high doses, it is not that toxic. That said, for a 4 year old, I would just give 2 packets and see if that meets the needs of a specific situation. A word to the wise about this product, it tastes awful! Best way to get it in a little person is to mix it with water and try to get them to swallow it down in a few gulps without tasting it. I have used this product for myself and my husband to ward of colds. Liposomal Vitamin C is a synthetic, meaning it is man-made. I like to stay as close to Mother Nature as possible, especially for little ones. But Lypo-spheric Vitamin is just so powerful that it is a must-have in my herbal cabinet. However, for everyday Vitamin C use, I like Pure Radiance Vitamin C by Synergy – capsules or powder. This is made from natural sources of vitamin C including camu camu, blueberries, and rose hips. I put this in my daughter’s morning juice periodically. Turmeric – Ava and I love turmeric (hubs not so much). We juice with it every morning, sprinkle it on eggs, it makes its way into our soups. This is a wonderful anti-inflammatory. I alternate between using a turmeric tincture (which I like because it is the whole plant) and Curcumin BP (which is more potent which I use for acute situations). The anti-inflammatory compound in turmeric is curcumin and it is notoriously hard for the body to absorb. That is why there is so much curcumin on the market today, it has been extracted from the turmeric to make it easier for the body to absorb. Turmeric or curcumin is best absorbed when taken with a fat such as coconut oil or eggs. Black pepper increases its absorbability by up to 1,000%. Curcumin BP (BP stands for black pepper) is very effective especially for pain of any kind. The Turmeric User Group on facebook has helpful information on how to use turmeric. Probiotic – This furnishes the gut with good bacteria. Pro=for, bio=life. Ava gets a probiotic every morning and evening but if your child is not on one, I personally would make sure to give them one. This is a brand we have had great success with, it eliminated abdominal pain that Ava had for months. Probiotic 11 which is less than half the price is also effective. The above combination is what has worked for us, each time I caught the UTI right away. Ava’s UTIs both happened at night and in the morning I gave her another dose of the above, even though she no longer had pain and was symptom free, I wanted to make sure things stayed that way! The following are other products that are widely reported to work well for UTIs. I just have not used them for it – D-Mannose, cranberry juice, horsetail, uva-ursi and pau d’arco. I have used pau d’arco for Ava’s yeast infections, it is an amazing, very versatile herb and great for UTIs. I would use it for a UTI but because the above has worked so well, I didn’t need to add it. Pau d’arco is one of the staples in my herbal cabinet and I don’t travel without it. Also, drinking lots of pure water is helpful. If you suffer from frequent UTIs, Urinary Maintenance can be taken daily as prevention. This is the gentlest blend in the Nature’s Sunshine lineup and can be taken as a long-term tonic to support the urinary system. It strengthens the kidney’s ability to flush toxins out as well as increases the flow of urine. To buy the Nature Sunshine’s herbs mentioned about, CLICK HERE to get the discounted wholesale price.